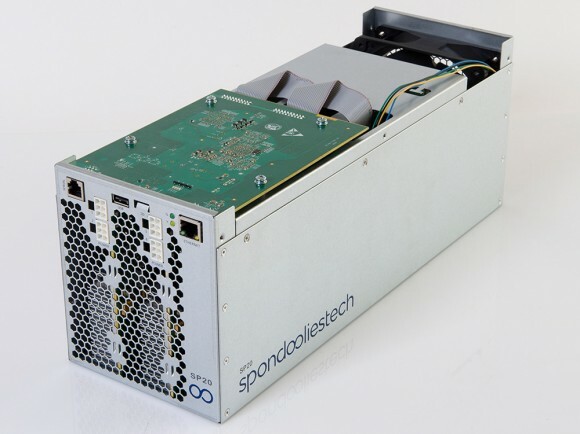 The Bitcoin ASIC manufacturer Spondoolies Tech is targeting the home miners with the new price of their 1.7 THS SP20 Jackson Bitcoin ASIC miner that is now available for a price of $795 USD with the November Batch 1 of the miner starting to ship on November 18th. The SP20 Jackson SHA-256 ASIC miner consists of 8 28nm Spondoolies-Tech RockerBox ASICs, comes with a dedicated Linux-based controller box that uses an Ethernet port for connecting the miner to your network. The miner does not come with a built-in power supply, you will need to add an external one that will be connected to the ASIC via 4 6-pin PCI-E connectors and it would need a minimum 1200W high quality PSU (1152 Watts actual power used according to the manufacturer). The one thing that is not very clear about the SP20 ASIC miner is what is he level of noise the cooling of the device produces (hopefully less than 60 Decibels), as in order to be suitable for home mining it should not be as loud as a server. Spondoolies Tech is probably not a know name for some of you as the company specializes in miners that are mostly used by larger mining operations and is also the supplier of some big cloud mining operations such as Genesis Mining for example. We suspect that the noise level at the listed power specification will not be very low, so do have in mind if you are interested in getting one of these to mine at home with.